W elcome! The second book in this new, darker series, The Resurrection (9th book in the entire series) carries on where Shadows of the Past left off, our favourite hero and heroine stranded in the hostile Catalia... Plenty of new faces abound in this continuing adventure, with older, more familiar faces also returning! 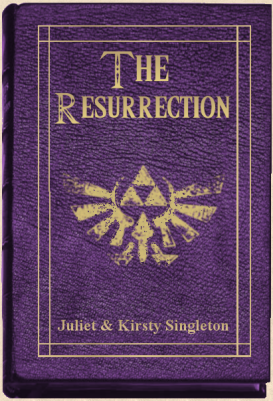 Set around a year after the previous series, Hyrule is suddenly in more danger than it ever has been, with three dangerous assailants, each with their own agenda, powers growing with each passing day. How will Link and Zelda deal with this new threat? Get reading! Link and Zelda, along with close friend Aaron are stranded in the hostile land of Catalia. On the run from Link's evil kin, the trio attempt to make their way to the safehouse of Queen Seline in the capital of Opela. But once they arrive, even the Queen is not pleased to see them, and Link meets a familiar face in the Queen's heir, who is also extremely hostile. But Robert, despite his feelings, promises them a safe voyage back to Hyrule. But it seems Link's dealings with his bitter tribe are far from over. This page was created by Juliet A. Singleton © 2000-2008. All rights reserved.